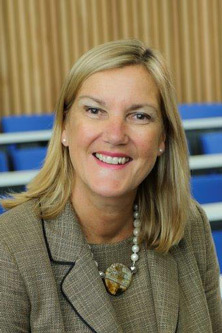 Liz Rylatt joined City as Chief Financial Officer in August 2016, bringing with her a wealth of experience from retail giants John Lewis, House of Fraser and Laura Ashley. More recently, she spent 18 years with the BBC. Although higher education is a sector that’s new for me, at the BBC I was Chief Financial Officer for the Operations Division, which had huge similarities to this role. The types of people you deal with and the governance processes within a public service organisation draw close comparisons and I really enjoy the inspiration when working with people that are academically excellent. What drew you to the role at City? Whilst I was working at the BBC I took on a governor role for Kingston University and I got involved in a lot of supplementary committees. I was part of the audit committee when Kingston were going through the Research Excellence Framework 2014, so I started to gain an understanding of the sector. When the job at City came up I felt that it was a perfect fit due to its focus on business and the professions. The most important thing is that we retain our ambition and the diverse student base is part of achieving that. What does the role of Chief Financial Officer entail day-to-day? As part of the Executive Team I support and advise the direction of the University and work hard to have the building blocks and tools in place to support that strategy. Will leaving the EU have an effect on the financial outlook at City? Over the summer a lot of work was done on modelling the potential impact of Brexit. From that piece of work we have forecast that leaving the EU may not have as big an impact as first thought. We have made enough strategic adjustments to ensure that we will be OK, especially in the short to medium term, with the scope to make more plans for the long term once more details are made available. Did you always know you wanted to work in finance? No, my father was a bank manager and when I got to the end of my degree in computer science at Newcastle University he suggested that training as a chartered accountant would be the best all-round business training. I think I can say I totally agree with him! Are you enjoying this part of London? I’m enjoying exploring the local area. I’ve been walking around Smithfields, Angel and Exmouth Market. Everything is so close and there are so many places to eat! I recently got myself a bicycle to help me get around faster. I have three girls who are all teenagers, so they keep me well entertained. We spend a lot of time shopping, we go to the Isle of Wight every other weekend and we have two dogs, so in my spare time it’s domesticity. We are a great family of cooks, so we do a great deal of cooking and entertaining, mainly for family and friends.